Many riders — both Western and English — seem to think collection is achieved by pulling the horse's head down and back with the reins. They associate collection with a certain head position or feel they can shorten their horse's frame through pulling the head back. This obsession of pulling on the head has ruined innumerable horses and caused them to round their necks excessively whenever any amount of pressure is placed on the reins. True collection involves re–balancing of the horse brought about through a combination of shortening the horse's frame and bringing his hindquarters further beneath his body. A horse in nature carries the majority of his weight on his forehand. This may be understood when you consider the head and neck extending beyond the front legs. Pulling on a horse's head may bring about a shortening of his frame through bringing the head closer to torso, but it does not relieve the front end of the weight. In addition, pulling the head back generally causes the horse to tuck his chin making it harder to perform his movements. Consider how the performance of a dancer or basketball player would be hindered by having him tuck his chin to his chest. The "frame" sought by so many riders is actually the result of collection rather than its cause. Collection should not be thought of as an end in itself but as a gathering of resources to be used in other ways. True collection is more than physical mechanics. It involves a drawing together the horse's body, mind, and energy so these resources may be sent forth into any number of actions. Collection may serve as preparation for the levade or the airs above the ground performed by a horse trained in the Haute École. But collection may also serve as preparation for extension where the horse is asked to move with the longest strides of which it is capable. In proper collection, a horse shortens his body by drawing his hindquarters forward and underneath his torso. In so doing, the horse raises his back to make room for his hind legs, arches his neck, and lowers his nose. The horse's head, however, should never come behind the vertical. At the same time, the horse also raises its withers through use of the muscles of the thoracic sling. When a horse brings his hind legs beneath his torso, these legs begin to carry more of the horse's overall weight. In contrast, if the horse lowers his head and brings it back towards his chest while rounding his neck, the horse's center of gravity is drawn forward, and he must carry even more weight on his front end than he normally does. Proper work at achieving correct collection results from a good understanding of balance and developmental exercises. One must learn to feel both his own actions and those of his horse in such a way that he can control his horse without undue tension. A tense body and a stressed mind cannot properly collect. Not every horse can collect in the same way. Nor need they. 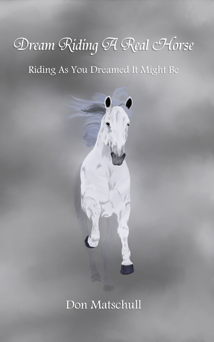 Different horses have different tasks to fulfill. 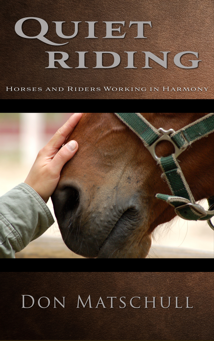 Still, working towards collection, when properly done, is beneficial for all horses. What horse cannot benefit from a gathering of all his resources so he can use them to the best of his ability in whatever task he is asked to perform? Extension or lengthening is often considered the opposite of collection. This idea probably derives from the fact that a horse moving in the state of collection takes shorter strides while extension or lengthening calls for longer strides. A horse in the state of collection carries his body in a compressed frame while a horse in extension expands its frame. The test of proper extension or lengthening is when a horse lengthens its stride without increasing the tempo of its movements. The forward speed of the horse increases because it travels further with each stride, not because these strides are quickened. This is an important distinction. Ignoring this distinction has often led to a misunderstanding of the term. For example, many riders see a horse increase its speed during extension. When attempting extension themselves, these riders may simply provide slack in the reins as they urge their horse forward. I have even witnessed Western riding instructors tell the rider to hold on to the saddle horn, stand in the stirrups, and lean forward when they ask for extension. Such action may result in the horse taking longer strides. Whether it takes longer strides or not, however, the horse will generally shift more weight to the forehand and quicken its pace to help stay balanced. On the other hand, there are riders — generally in English style saddles — who understand that the extended trot requires the horse to take longer strides. 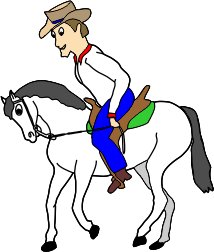 These riders may often be seen leaning backwards as they drive there horses forward with strong leg and spur action. To keep the horse from quickening its rhythm, they often pull their horse's head towards its chest. The result is a horse that throws its front feet so far forward that it must withdraw the foot again to place it on the ground. Again, this is not true extension. A horse can best extend its stride when the rider remains balanced and allows the horse to extend its head and neck. The horse should use its back muscles freely as it draws its hind legs forward in a long stride and lets them trail further behind before lifting them from the ground. The action of the horse's neck helps draw the front legs forward to their maximum extension while not throwing them so far forward they must be withdrawn to before being placed on the ground. The maximum extension of the forefoot should be where the foot is placed. Maximum extension is best achieved when a collected horse is allowed to release its energy in a forward thrust.